Gabe Howe looks out across the Kalmiopsis Wilderness. Gabe Howe stands at the trailhead of Babyfoot Lake with a pair of loppers resting on his broad shoulders. He surveys a vista of charred trees, bleached bone-grey in the scorching sun of southwestern Oregon. The dead trees stretch over contorted ridgelines as far as the eye can see. Gabe knows these ridgelines well, each mile of a trail that starts here and twists, pitches, and plunges some 26 miles across this wilderness. With him is a small crew of enthusiastic volunteers. They take turns weighing their backpacks to see who will heft the heaviest. Gabe looks on with a slight smirk, knowing that all the bravado at the trailhead will wear off soon enough. At first glance, Gabe looks like he could lead a work crew into the wilderness. He is barrel chested, with short-cropped sandy hair, and a face often red from sunburn and sweat. His deep voice is even more gravelly this weekend because has a cold. And his hands have been worn hard and smooth as the wooden handles of the tools he’s used over the last decade. He looks like he stepped off the page of Sometimes a Great Notion, or like a young Ken Kesey himself. And this seems fitting, as Gabe is an Oregonian with a vision and tools to shape a wilderness before him. Vision, yes. One grand and romantic and seemingly hopeless. But it’s backed up by grit and sheer stubbornness. The crew has packed for a seven-day backcountry trek — enough weight to be grueling for even the strongest — but in addition, they carry wood and steel tools. Not high-tech backpacking gear, but literally logging equipment from the last century. It’s Memorial Day weekend and they have returned for what is now an annual tradition — to continue the work that Gabe and his wife, Jill Stokes, started a decade ago: To clear scores of dead trees from the trail. Each winter, windstorms topple the trees and brush springs up to choke the path. So at the start of each summer season, the Siskiyou Mountain Club returns to hack the trail back. It is a repeating cycle of hard labor, akin to the Greek myth of Sisyphus, who rolled a massive boulder up a mountain each day only to have it tumble back down each night. But while the task of rolling the boulder was forced upon Sisyphus, Gabe and Jill have taken on the punishing labor of wilderness trail work by choice. Partly because they can. And also, Gabe says with his deep gravel chuckle, because others said they couldn’t. The landscape here still shows the signs of the 2002 Biscuit Fire. Gabe and Jill first came to explore the Kalmiopsis Wilderness in 2006. “It was sunny and it was hot and it was hard,” Jill recalls. “And we started descending and it was a complete disaster and we lost the trail,” adds Gabe. 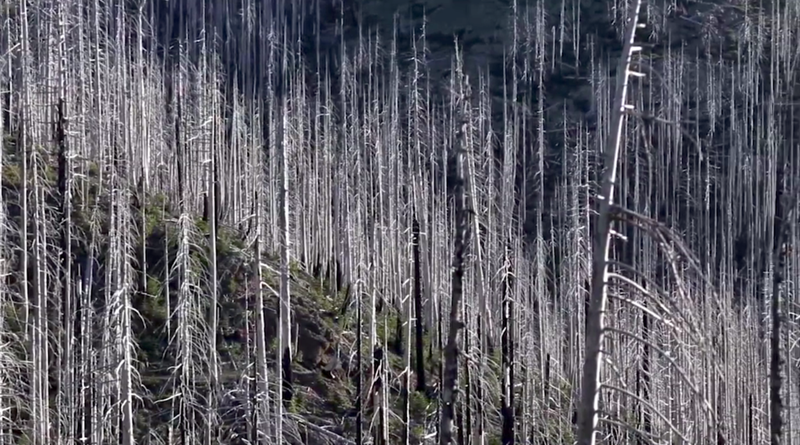 Just four years before, the wilderness had burned in what was then the largest wildfire recorded in Oregon. The Biscuit Fire charred approximately a half-million acres. The area’s 153-mile trail system was devastated, making a rugged place even more rugged, and hiking into its interior impassable. Gabe and Jill started kicking and hurling sticks from the trail. When they looked back, they saw their efforts had made a difference. “And that was what sort of sparked: Wow, it doesn’t take any special knowledge or anything to just move the sticks off the trail,” Jill explains. The trails had first been built by the Civilian Conservation Corps during the Great Depression as part of the massive back-to-work program of the New Deal. Without a similar scale of resources and federal support, it wasn’t clear if the U.S. Forest Service would ever rebuild the trails again. So Gabe and Jill had an ambitious — maybe even ludicrous — idea: They would rebuild the trail themselves. Gabe and Jill rallied their family and friends, rounded up whatever tools they could find, and headed back to the Kalmiopsis. They set their sights on restoring the Trans-Kalmiopsis trail. Before the fire, it cut 26 miles from one end of the wilderness to the other. Their plan seemed simple enough. They estimated, if they worked really hard, it’d take them the entire summer. It wasn’t simply the volume of downed timber to clear; they had to cut every single log by hand. Federal wilderness regulations prohibit the use of vehicles or mechanical tools, like chainsaws. Several folks suggested that Gabe and Jill could probably get a special permit from the Forest Service, since the scale and circumstances of clearing the Trans-Kalmiopsis was so unique. But the couple chose to stick to the specifications of the Wilderness Act. Jill Stokes takes her turn on a crosscut saw. Luckily, one of the hard-working volunteers of their team had grown up working in the woods. Aaron wanted to find a route to the Chetco, and teaming up with the Siskiyou Mountain Club was the way to penetrate the Kalmiopsis backcountry. He brought to the club the skills to work a crosscut saw and swing a pulaski — a wildland firefighter’s hand tool that’s been in use for more than a century. “Right away I could see this guy was good,” Gabe says. Aaron Babcock teaches volunteers how to use an old-fashioned crosscut saw. Aaron is now the Trail Crew leader. He doesn’t say much. He watches two volunteers struggle as they try to force the saw through a log. He waits. Their pushing and pulling slows as the weight of the log begins to bind the blade. Then he silently steps up, taps a logger’s felling wedge, opening the cut for the saw to slide again. Sometimes he just shakes his head, as two volunteers grunt and sweat. When an old saw is really working there is hardly any pressure; it’s a synchronized pulling of two sawyers. Never a push. The weight of the old steel rakes small curls of sawdust. The steel almost sings. When Gabe and Aaron take the saw, it is like this. They have learned that a little extra time saves a lot of energy, and ends up making the cutting faster. As they worked to reopen the Trans-Kalmiospsis trail, they counted the number of trees that they cut. After 15,000, they stopped counting. Gabe remembers working on the trail one day when he saw a rare sight: other hikers. They stopped to ask Gabe what he was doing. “We’re cleaning up the Kalmiopsis trails!” he announced proudly. The other hikers looked at Gabe, and then across the expanse of dead trees. “Aren’t these trees just going to keep falling?” they asked. Dead trees fall every year in the Kalmiopsis, blocking the trail. As Gabe and Jill labored to put the Kalmiopsis trails back on the map, they learned that the reason the Kalmiopsis was even on the map in the first place was because of another married couple who had blazed their own trails some 80 years before them. Like Gabe and Jill, John and Lilla Leach were from southeast Portland. And also similarly, John and Lilla met in college. Rather, her dream was to be a botanist—to set out into unexplored territory and to discover new species of rare flowers. In 1928, they loaded up two burrows, Pansy and Violet, and set off. They returned the next season, and then the next. Then, one day in 1930 Lilla came across a plant she had never seen before — a low shrub with tiny purple flowers. It blossoms briefly in the spring and grows only in a few pockets of these mountains. The hearty shrub started evolving before the ice age. It’s believed to be the oldest living member of the ericacae family, more commonly known as heath or heather. As an amateur botanist, Lilla had to fight to be recognized for her discovery. She prevailed. The plant now bears her name: the kalmiopsis leachiana. “It’s this beautiful shrub, which anyone would want in their backyard,” explains Gabe. For that reason, it wasn’t long after Lilla’s discovery that nursery owners began to pillage the populations of the leachiana. It was soon clear that the small clusters of flowers were in peril. So Lilla and John pressed the Forest Service to create a protected area. In 1946, the Forest Service designated almost 77,000 acres to be protected for its biological diversity. And it is from Lilla’s flower that the area gets its name. When Congress passed the Wilderness Act in 1964, the Kalmiopsis became one of the first areas to be protected under that status. In 1978, the area was expanded to encompass nearly 180,000 acres, making it Oregon’s third-largest Wilderness Area. The kalmiopsis leachiana, named after Lilla Leach. Beyond the Kalmiopsis’ protected borders stretch many more miles of rugged land, among the largest blocks of undeveloped forest on the West Coast. In fact, the swath of roadless forest adjacent to the 179,755-acre Kalmiopsis Wilderness is at least as large, estimated to be between 180,000 and 200,000 acres. While millions have heard of Oregon’s popular Rogue River just to the north, or the famous Redwoods to the south, few people know the names of this area. The adjacent wild areas are simply called “North and South Kalmiopsis Roadless Areas.” Yet together, they are the largest National Forest Roadless Area in Oregon. Beyond the borders of the Kalmiopsis Wilderness are as much as 200,000 acres of undeveloped forest. Within this area flow five rivers eligible for Wild and Scenic Rivers status, according to Kalmiopsis Rivers — Baldface Creek (tributary of the North Fork Smith), Rough and Ready Creek, Josephine/Canyon creeks and Silver and Indigo creeks (tributaries of the Illinois River). When most people think of the Redwoods just to the south, they tend to think of lush woods of towering trees, ferns and spongy hiking trails, all blanketed in fog. But here, the land is twisted and rocky. Geologists say that this land was once the bottom of the ocean — and that it was scraped up. Ridgelines don’t go the usual north-south, but seem to be jumbled, pitching and falling every which way. The soil is classified as serpentine — a dark green that turns red when oxidized, staining the landscape in rust color. Although you can see the Pacific Ocean on a clear day, the rocky land looks more desert than Pacific Northwest temperate rainforest. From the labyrinth of peaks flow pristine rivers, pooling in hidden swimming holes, and secluded lakes that Gabe and Jill have discovered in their free time. When not clearing trail, they spend their vacations here camping and swimming. They now bring their kids. Jill Stokes hikes with her daughter Azalea to a secluded lake. Their daughter Azalea is named for one of the area’s flowering plants, and their son Carter for one of its creeks. On this particular day, they’ve hiked over a ridge and dropped into a red, rocky basin with a clear cirque lake surrounded by pine trees. Gabe sits on a rock, letting the late afternoon sun warm his bare chest as he watches his family kicking an inflatable paddle board. “When the Wilderness Act came out,” he says, “the purpose of it was to define some American frontier.” A key word in the act is “untrammeled.” Gabe points out it does not mean untouched. It means free and unrestricted. And this quality is what Gabe loves about the Kalmiopsis, what has held him here for more than a decade and is why he brings his young children here to experience it for themselves. By dusk, the family gathers firewood. They sit and watch the coals glow. Above, the Milky Way arcs, reflecting in the still lake. “It becomes a character of your life,” Gabe Howe says of the Kalmiopsis. The Howe family in the Kalmiopsis Wilderness. Part of what makes this wilderness so wild is the lack of people — in large part because of the challenge of access. By their very work of restoring the trails, Gabe and Jill are making the Kalmiopsis easier for more people to visit. The publicizing of their accomplishments puts the practically-unknown Kalmiopsis into public view. They are aware of other natural areas in Oregon that have become overrun by hordes of urbanites and hashtaggers. They would hate to see what has happened to other natural places come to the Kalmiopsis — such as bags of dog poop left trailside and hikers with music blaring. They are concerned. But ultimately, they want more people to know, and in turn, sincerely fall in love with this special place. The Kalmiopsis looks more like desert than Pacific Northwest rainforest. What started as a rally of friends and family has developed into a nonprofit organization with more than 600 members. Gabe serves as the executive director of the The Siskiyou Mountain Club and champions its singular mission: rebuild and maintain the trails of this region. In addition to the annual Memorial Day trip, they restore trail all summer season with teams of paid interns. They now have contracts with the Forest Service and Bureau of Land Management to work on trails across the Siskiyou region. They have now helped bring back some 150 miles of trails and maintain 280 miles of trail in seven different wilderness areas. So the cycle continues. Brush grows, trees fall and the metaphoric (and sometimes literal) boulder rolls back down the mountain, blocking the path. And each spring the self-appointed Sisyphus of the Siskiyous starts another season. Gabe Howe has devoted more than a decade to reopening an Oregon wilderness for others. This article is part of the “True Oregonian” series, which profiles the people or groups who embody Oregon’s pioneer spirit and values, such as self-reliance, intrepidness, vision, and love of place.